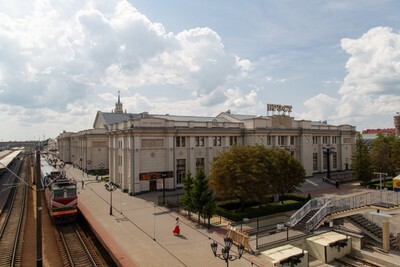 After saying goodbye to Kasia and her family, we went to the train station and departed Warsaw towards Brest in Belarus. The fun started at the border. First, our passports were checked by Polish border control, then the train moved 5 more km and stopped again right after crossing the Belarussian border. The change in countries was very apparent. Amongst old concrete buildings and wired fences the Belarussian border guards were waiting for us, dressed in uniforms we have seen before on the stereotypical Soviet antagonists in movies set during the cold war. Two ladies collected everyone’s passports and started to check them. Next, a man in a blue uniform, most likely a customs officer, wanted to check the identity of the bags on the huge luggage stack. After that another lady asked us swiftly about the purpose of our visit, how much cash we have with us and if we carry medicine. After 30 minutes, the first lady gave back our passports and the train moved again. It was smoother than we expected and we arrived quickly to the Belarussian border town Brest where we exchanged some Polish Zlotys for Belarussian Rubles and bought our tickets to Minsk. After that we went to search for a restaurant to eat lunch in the town. This proved more difficult than expected, but after some wandering around, a nice man on the street approached us and offered his help. He walked with us five minutes to a small restaurant for which we were very grateful. Marta ordered cold beetroot soup, with cucumbers and eggs, and Sam ordered Draniki (the national dish of Belarus, basically potato pancakes, very similar to the Swiss Röschti) and a Belarussian beer. For this we paid around 7$. After lunch we went back to the train station to board our train to Minsk. 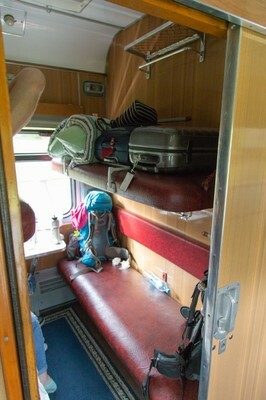 It turned out that unknowingly we had bought two places in a 4-person-sleeping-compartment. Online we read that we should always ask for “Kupe” when buying a ticket which turned out to be the sleeping-compartment. It was odd for us that this even existed on a train which departs its first station at 15:48 and arrives at its final destination at 19:31. Our entrance to the train was very funny. In our compartment were 4 people and quite intense screams. It turned out that a small boy had to say goodbye to his grandmother. The farewell was very dramatic. After the train (and the grandmother) left, the lady with the boy has started preparations for the night (it was 4pm and bright sun outside). The boy, approximately 3 years old, was lullabied in her arms for the next 15 minutes with completely closed windows and doors, and no fresh air. Complete darkness was supposed to help. Indeed, it was very efficient. The crying boy went to sleep and she opened the compartment door for fresh air. The train was very old. The compartments are wooden inside and old carpets are spread on the grounds. There are 3 charging outlets for the entire carriage and AC does not work. The beds are quite hard. For 4 hours we watched never-changing forest pass by our window. Belarus is a very big country but not very densely populated. Most of its territory is flat lands covered in thick forests. 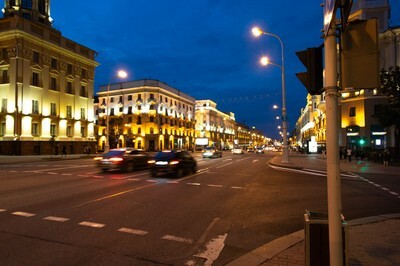 When we arrived in Minsk, the capital of Belarus, we were positively surprised by the city. Our hotel was located right on the most important street of the city, which was full of beautiful buildings. The city is very clean and spacious and it is very comfortable to discover it on foot. The main difference we noticed compared to other European capitals was the lack of tourists. Even though we were definitely not the only ones, there were clearly not many which meant that the main sites were never crowded like they would be in other countries. In general, the city, despite being very lively, never seemed very full, which we enjoyed a lot. On the day after we arrived, we mostly just walked around the city. Architecturally, there were a lot of massive concrete buildings which must have been built during the Soviet era. There were also many nice churches and parks. 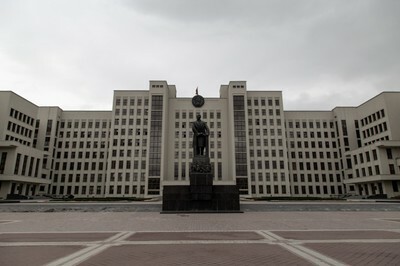 Belarus has a law that “official buildings” must not be photographed, so we were hesitant to take pictures on that day, since any building might be an official building. The next day we did a guided walking tour of the city, where we learned, besides the history of Belarus, that this photography-law applies only to very few buildings and that almost anything can be photographed, so we took more pictures on that day. 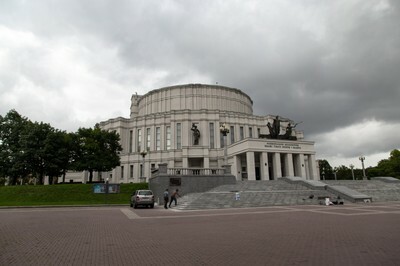 The cloudy weather that day added to the Soviet look of some of the city’s buildings. To learn something about the life in Belarus, we decided to join an English-speaking-meeting that we found online. Indeed, we met only Belarussians that were eager to practice English there. From our conversations we got the impression, that Belarussians are nice and friendly people, but that they are not particularly optimistic about their life in Belarus. They see the future in Europe, but themselves standing at the side, not having access to the opportunities that people in other European countries have. Of course this was only communicated between the lines, since criticizing the president is illegal in Belarus. 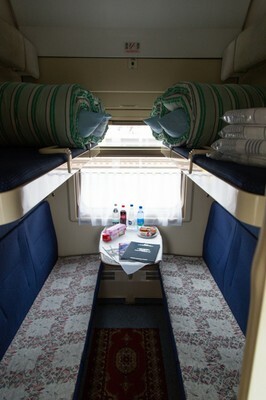 Our train to St. Petersburg was fortunately significantly nicer than the train from Brest to Minsk and no one else seems to have booked a spot in our 4-person-compartment, so we had a comfortable night on the train to St. Petersburg.